The gallery on the Samsung Galaxy Alpha supports DLNA for viewing local files along with Facebook, Dropbox and Picasa integration. There's an option to sync online albums only over Wi-Fi to spare your data connection. The gallery groups images by Time or by Album and you can filter them by Events or People. If you enable Face tag, the Gallery will automatically recognize faces and let you link them to your contact list. If that contact doesn't have a photo, the Gallery will offer to make one from that photo. Pinch zoom will change the size of the thumbnails and can also open and close individual photos. Batch operations are supported and that includes assigning photos to an event or person. The single photo view has several shortcuts for sharing, including over DLNA or Wi-Fi Direct. The Quick Connect button in the notification area will scan for all ways you can share something in the Gallery with nearby devices. You can easily edit images right in the Gallery itself. The new Studio option is quite powerful and can do anything from basic editing and photo collages to creating and trimming videos. It also handles the post-processing of Shot & more photos. 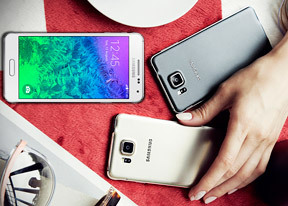 The Exynos 5430 chipset that is at the heart of the Samsung Galaxy Alpha has a Seiren co-processor. It's a Cortex-A5 processor that's tasked exclusively with decoding audio, band equalization and sample rate conversions. The Snapdragon 801 version of the Galaxy Alpha lacks this additional core. The TouchWiz music player on the Galaxy Alpha is jam-packed with features and supports a wide variety of file formats, including FLAC. Music is sorted by several categories and you can hide some categories you don't need. Folder view is available and so is scanning for DLNA servers (Quick Connect helps with this). Music square is an alternative way to create a playlist - the phone scans your music library rating each track in terms of tempo (Exciting or Calm) and emotion (Passionate or Joyful). It can then load a playlist matching your chosen tempo and mood. The emotion axis in the graph can be switched to Age, which makes it easy to automatically create a playlist of classics or contemporary hits. Samsung has enabled several audio-enhancement features. The SoundAlive equalizer presets are cleverly organized into a square similar to the Music Square. The presets balance between Treble and Bass, Vocals and Instrumental. The advanced equalizer view gives you a proper seven band equalizer you can tune manually and enable additional effects like 3D, Bass and Clarity. Additional sound effects are also available. The list of audio features doesn't end there. Smart volume will keep the sound level consistent across tracks, while Adapt sound automatically tests the performance of your headphones and tunes the equalizer based on that. The video player on the Samsung Galaxy Alpha handles files from the local storage and DLNA-compatible devices. Once in a video, chapter preview lets you jump to a specific scene. The video player is missing support for some decoders though. The main omissions are multi-channel audio decoders (AC3, DTS) and the DivX video decoder (XviD works just fine though). MP4 and MKV files with the h.264 and AVC codecs are supported all the way up to 2160p resolution. The Exynos chipset has built-in h.265/HEVC hardware decoding though none of the h.265 video samples we had worked. Even though audio decoding support is spotty, it's great to see the same SoundAlive audio-enhancing technology from the music player is available here, too. There are additional settings for playing the audio over Bluetooth (if you have wireless speakers), as well as the brightness and playback speed. If subtitles are available, the video player will automatically find and load them. You can also manually load subtitles if the video and subtitle file names don't match. The Samsung Galaxy Alpha does a great job as far as the quality of its audio output is concerned. The smartphone did a perfect job in the first test (the one where it's connected to an active external amplifier) and got amazing scores top to bottom. 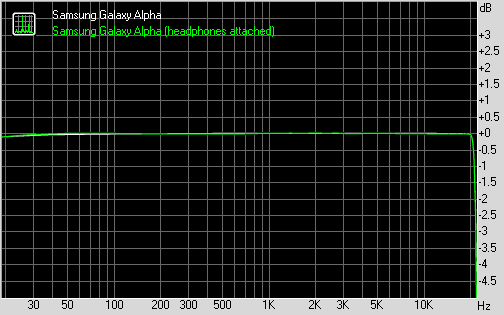 It also showed above average volume levels for an all-round audiophile pleasing performance. Plugging in a pair of headphones didn't do much harm either - outside of the limited spike in stereo crosstalk, the output didn’t deteriorate even a bit. Outside of the HTC One mini 2, there's no better performer than the Galaxy Alpha in this class and let's face it - the HTC smartphone is better than just about everything else on the market right now.